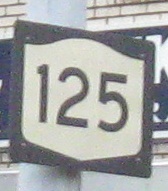 No, NY 125. Courtesy Doug Kerr. The route ends SB at US 1. These old suburban overheads are disappearing quickly. NB at the Heathcote Bypass, a 2-lane grade separated expressway west of downtown while NY 125 slogs through the congested center of Heathcote. 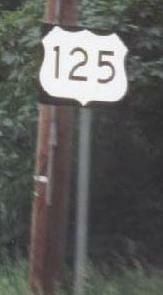 So why not put 125 on the better road, the one signed for through traffic? Why is the bypass a town street, and the town streets are a state highway? Built on a former railroad, the bypass's overpasses even have enough room for a second carriageway, or at least an undivided four lanes, suggesting plans for something more. I don't think it was related to the proposed freeway along the corridor (see Steve Anderson's site, linked below), but it would make sense to continue the bypass along the railroad ROW to Bloomingdale Rd. - which has an overpowered interchange with I-287 just north of that point. So maybe it was related, after all? Click to drive the Heathcote Bypass NB from NY 125 to NY 125.